I gave a talk to the Family History Society last week, looking at what you can find out about people who lived in Victorian Caithness using some of the less common sources. And while I was thinking about how best to showcase the registers of fishing boats with a Wick (WK) registration I had an idea. 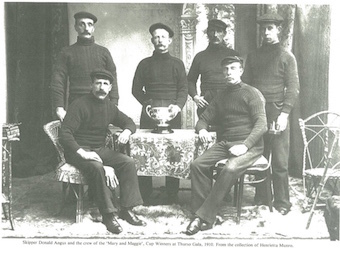 Both of the Wick ganseys I’ve knitted have been based on a photograph of Donald Angus’s 1910 prize-winning crew of the Mary and Maggie (WK.29), which appears in both Hetty Munro and Rae Compton’s “They Lived By the Sea” and Michael Pearson’s “Traditional Knitting”. 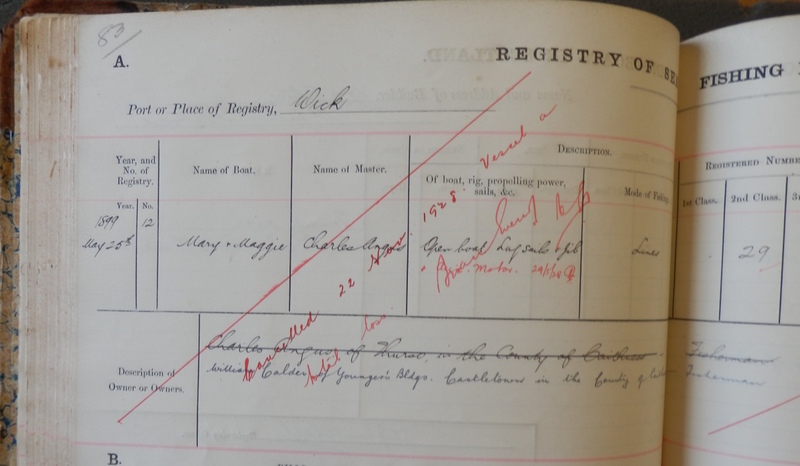 So I looked the Mary and Maggie up in the register, and this is what I found: the boat was registered in 1899 and one of the joint owners was a Charles Angus of Thurso, whose occupation was fisherman. Now, Angus isn’t a very common name up here, so someone called Charles Angus who was also a fisherman wasn’t hard to find: in fact there was only one, and he lived in Shore Street. 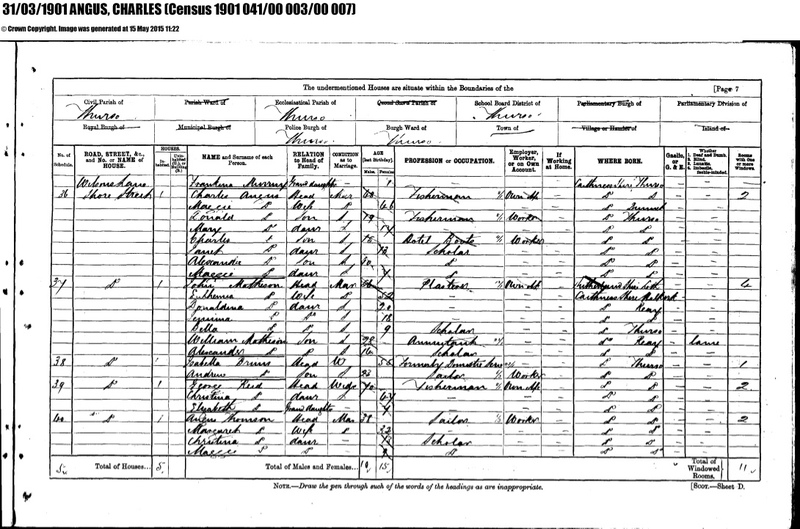 I found his death certificate online, and learned he died in 1927, aged 72. This was interesting, because the register says that the Mary and Maggie’s registration was cancelled in November 1928, with the vessel “a total loss” – so the boat only survived its owner by a year. It doesn’t make a lot of difference; but it makes me feel a little closer to the people in that photograph, somehow. One of them, at least, isn’t just a face and a name. Now, gansey news. As you’ll see, I’ve been making good progress; but there is a problem, which you can see if you look closely at the top couple of diamonds compared with the rest. They look different, don’t they? You see, after I knitted the Lopi jumper last Christmas, my gansey stitch gauge went all to hell, and ever since I’ve struggled to rein it in. As a result, my last couple of ganseys have bloated and sagged, like a well-fed burgess after a civic function, undoing his trouser buttons with a contented sigh and letting his waist expand like a cottage loaf in the oven. Now I quite like baggy jumpers, so that was fine, but something’s gone wrong with this one. It’s too big, too loose, to the point that the pattern has lost definition. 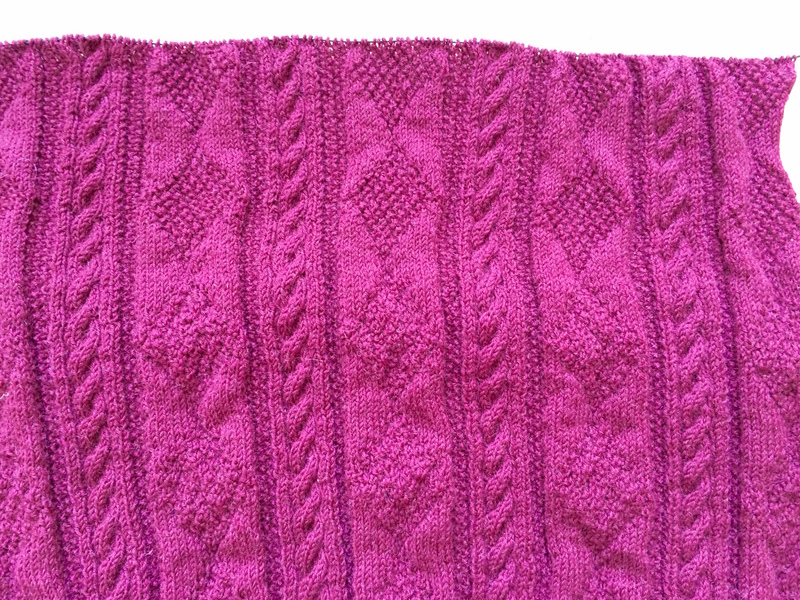 I put it on a strict diet and exercise regime and deliberately knit the last couple of inches more tightly, and you can see the results for yourselves: the diamond pattern is crisper and clearer, better defined, compared with those that came before. There won’t be a blog next week, not because I have to be whipped from one side of the town to the other in punishment for what I’ve done, but because Margaret is away just now (I thought she was just knitting shawls; turns out it was a lace rope ladder to climb down the wall of her turret and escape across the fields) and I’m going to take a break and think about what to do next. See you in a fortnight! Gansey Nation will return on Monday 1 June. Have you ever considered knitting with the deadly DPN spider and knititng sheath/pouch/belt? Once you conquered the beast it gives so much better stitch definition and tightness of fabric. I tried a knitting sheath many years ago, but I couldn’t make the adjustment. The stitches kept dropping off the edges, and it was like trying to shear a paralytically drunken sheep with it sitting in your lap; I quickly gave up! But I have the sort of hand-eye coordination that once I’ve found a method that works, I can’t change it to something else. 9stitches per inch on 2,25mm needles without a sheath/belt is very impressive indeed!! I reach 9 or 10 stitches per inch only on 2mm needles WITH a belt. I have to admit learning to takle the belt/sheath was quite a steep learning curve for me as well, as I am a continental style knitter, but I am happy I stuck with it. Now I would not want to knit any other way, even top down raglan sweaters. The problem with a gauge of 9 sts/inch is that the resulting gansey can be stiff enough to use in partition walling, but you can create a really intricate patterned effect at that scale. I’ve seen videos of people sheath knitting and it’s amazing the speed they can achieve, not to mention the skill they display – really stunning. Alas, in this instance, I’m the tortoise, not the hare! ‘Launched in April 1900 under Captain John Coppack, she was named Lizzie May after the Captain’s daughters. […]by 1908 she had sailed nearly 40,000 miles (64,000 km), when she was sold into the coal-shipping fleet of Martin J Fleming of Youghal, Ireland, and renamed the Kathleen and May after his daughters’. Charles Angus was a man of his time…! Of course you’re right, and I shouldn’t be surprised (though it was not unusual for boats to be sold to new owners with no connection to the names); but my delight in this case came because I wasn’t expecting it—I was just looking for a way to demonstrate how the registers can be useful for family historians, so finding the Mary and Maggie connection was a real bonus. Ach, it was a calculated risk—I knew my gauge was awry, and I was using this gansey to see if I could sort it out. Of course I was hoping it wouldn’t be so obvious! But, as the old saying goes, “if in doubt, rip it out” (or if it isn’t an old saying it should be), so out goes he. I have done this, and what it comes down to is a love of the knitting process rather than the finished article. I find I HAVE to knit, and if I have to knit it twice, well, OK. 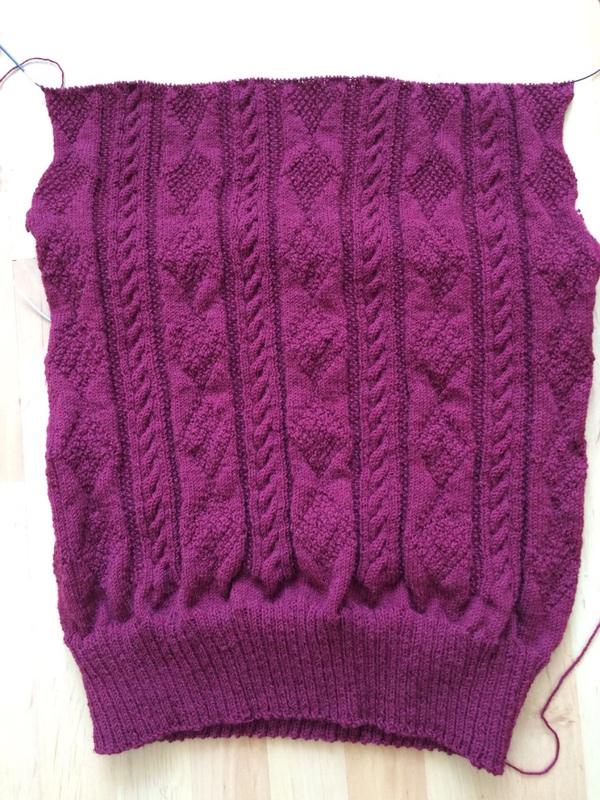 Recently, knitting a first pair of socks for Bill, I found I was rather addled and got the gauge all wrong (in spite of knitting the sample) AND did the maths wrong. It has taken me 5 months to knit this pair of socks, the first because of the gauge, and the second, also twice, as I lost the first on a trip. I’m really glad I enjoy knitting or I might feel discouraged and never attempt another project. Hi Gail, I think you sum up my feelings about it being a process very well. It’s a bit like writing – when you’ve written 1,000 words, having to delete 500 seems like the end of the world; when you’ve written 10,000, it’s surprisingly easy to lose a few hundred! 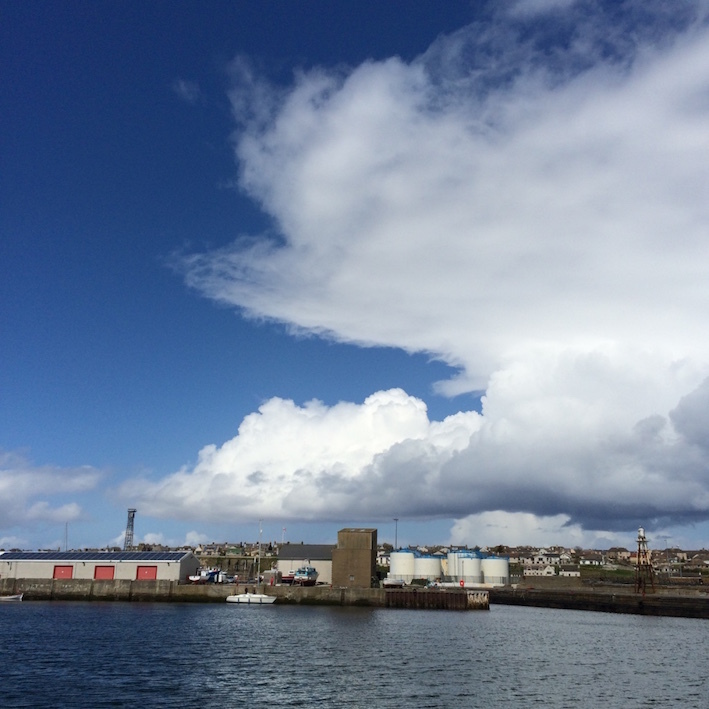 Thank you for the story of the Wick fishermen, as you have probably guessed, for me it is all about the stories. If we talk and if we knit, then it all lives on a little bit longer because otherwise, as you said it is all lost so quickly! Most unfortunate with the gansey, but these things happen, and to all of us. I started Chloe a lovely copper coloured garter stitch spencer a few months ago. In the rough and tumble of Christmas some stitches got knocked off the needle, all beyond help, had to be Stoic after all not one of the cats! Is it all right to assume the tension difference happened when the gansey moved from in the round to the back and forth split at arm to shoulder. I have agonised over the years about this mysterious tension thing and have decided I don’t really understand it. So I stay relaxed and let the yarn find a gentle way through the old digits, seems to work quite well. Take care. Occasionally I get the yarn caught on something as I tug on the cone to pull more out, so that instead of freeing up more fresh yarn I end up yanking about 20 stitches off the needles, and i watch helplessly as they leap off the needles like a stick of paratroopers jumping out of their plane over Normandy on D-Day. I’ve been experimenting with tension over the last 2-3 ganseys, seeing how I felt about a looser gauge. (Short answer – I like the soft drape of the resulting ganseys, but if too loose – as here – the patterned stitches lose clarity.) So I decided to play around with it this last week and firm it up a little, and voila! The pattern resolved into focus, while really showing how unclear the rest of the gansey was. But now I’ve got my proper gauge, I can rip this one out and start something else, job done!. Halloooo! goodness gracious, Gordon, what you get up to when my back is turned. I knit a sweater to the armholes for a (short-lived)high school boyfriend, and it lingered unfinished for a long, long time. One day in sewing circle, my friend Margaret said I’ll rip it and proceeded to do so. ACK!! I watched in horrified amazement. She was very cheerful and returned reconditioned wool to me. Her example was cathartic and I’m now able to do so myself, albeit not quite cheerfully…yet. When you say your high school boyfriend was short-lived, do you mean the relationship was over quickly, or…? Gordon, we call the process you are about to embark on “frogging”, because you just “rip it, rip it, rip it”. Do I sound like a frog yet? Knitters on this side of the pond love to have cute names. Mostly it sounds like someone mowing the lawn two gardens over, but I like your version better! I got confused, because isn’t it a term for a fancy embroidered cost or something? Or am I mixing it up with a frog coat? Flying spider assault troops are a scary thought. Round here they’d have to get past the seagulls, which operate was a sort of Spitfire scrambler squadron which can be airborne in seconds to pick off enemy air attacks. All you’d have to do was spread the rumour that the spiders were bringing sandwiches and chips and the seagulls would be all over them, one bite, one swallow, sorted. And did I ever tell you about the James Norbury fisherman’s jumper in Aran. The back was finished, super pattern, lovely yarn, husband thrilled, small problem with length, far, far too long. I do not know quite how it happened, well I think I just kept adding rows for a very tall man, too many rows, but it would not do at all…. We knitters know so much about the learning curve!